Open a Bet365 Vegas account through the link today, make your first deposit of between £10 and £50, turnover the amount four times and receive a free spin per £1 up to 50 free spins. 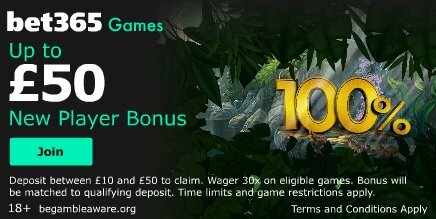 The promotion is available to new Bet365 Vegas customers unitl 10:59 Wednesday 15th May 2019 who make a deposit of £10 or more and click on Claim Now in the Offers Available section in Members. The Free Spins must be accepted within the seven days of completing the wagering requirement by opening a qualifying game. Qualifying games are: Starburst, Aloha Cluster Pays and The Legend of Shangri-La. New Games customers only. Deposit/transfer between £10 and £50 to claim. Wager 30x on eligible games. Bonus will be matched to qualifying deposit. Time limits, game restrictions and T&Cs Apply.